Welcome to India, or as we say ‘atithi devo bhava’(the guest is an incarnation of God). Thank you for giving us the opportunity to serve you! Chausinghas, Sloth Bears, Barking Deer, Swamp Deer (Barasingha), Blackuck, Langurs, Wild Boars, Porcupines, Mouse Deer, Hyenas, Jackals and Wild Dogs (Dholes). The pattern of early morning and afternoon excursions will be interspersed with periods of relaxation back at our accommodation during the heat of midday. Although Tigers are the star attraction at Bandhavgarh the supporting cast of mammals and birds is very impressive, the latter including such species as Grey-headed Fishing Eagle, Plum-headed Parakeet, Malabar Pied Hornbill, Greater Racket-tailed Drongo and Asian Paradise Flycatcher among a total of over 250 species recorded in the district. Tour members with an interest in ornithology will value the time between game drives as an pzportunity to explore some of the habitats close to our base. Meeting & assistance upon arrival check into hotel. After a leisurely breakfast, we ride to the massive Agra Fort. The elegant buildings inside reflect an interesting synthesis of Hindu and Central Asian architectural styles. Built by Emperor Akbar, the maze of the courtyards, mosques & private chambers of the fort echo the story of the Mughal Empire. 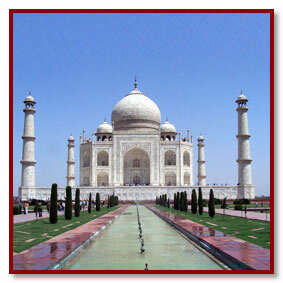 The Moti Masjid & other magnificent buildings reflect the skill of the ancient Indian architects. Morning and evening jungle excursions in open top vans. Ranthambhore is known to have India's Friendliest tigers Assured of protection; these nocturnal creatures are seen often in the day. 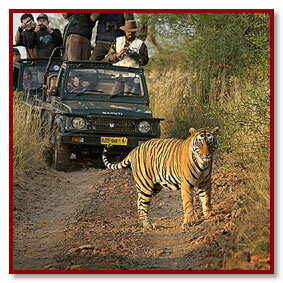 Sprawled on the Aravalli and Vindhya ranges of Rajasthan, Ranthambhore National Park encompasses an area of 410 Sq. km. in which lives a healthy population of about 40 tigers. A large number of deer inhabit the area and leopards are occasionally sighted. The Pandam Taloa lake, located adjacent to theJogi Mahal hunting lodge, is the park's favorite water source. Smaller pools at Raj Bagh and Milak also attract a variety of wild life The best way to explore Ranthambore is in open top vans as the park is well connected by arterial roads and tracks. 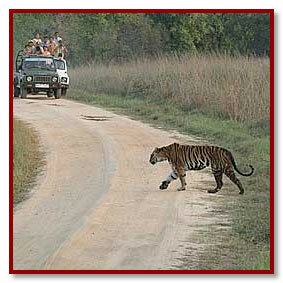 Some of the popular sighting areas are Nal Ghati, Lahpur, Bakuala , Anantpur and the Kachida valley. Mammals : Tiger, Panther, Hyena, Jackal, Jungle Cat, Caracal, Sloth Bear, Sambar, Chital, Nilgai, Wild Boar, Chinkara, Indian hare mongoose. Birds : Bonelli's eagle, crested serpent eagle, great Indian horned owl, grey partridge sandgrouse, quail, spurfowl, common peafowl, tree pie, paradise flycatcher, pheasant tailed jacana, painted stork, black stork, spoonbill,green pigeon, ducks.